I admit to finding this an insurmountable task. My novel has dozens of characters. My first problem wasn't keeping track of them, but creating them. My 20th century characters were easy. I tweaked ages, genders, names, and family configuration a few times, but they were mostly set in a few days and fully set after a week or two. Impossible! Seriously, months. Months of not writing a bleeping thing because I couldn't move forward without knowing my family units and having it all together. I couldn't just make it all up because this is based on a Bible story. There are multiple existing characters and I had to research every last one of them (much harder than you think as the source material is not as clear as one might like). Then fill in the gaps (which is mostly the women and girls). I didn't post for help with this process because I knew the answer: Just make yourself do it!! So I did it. Word: I started off in Microsoft Word. I'm still writing my chapters and doing all my notes on different topics there. But for lists of characters and their attributes, nope. Excel: I love a good spreadsheet. 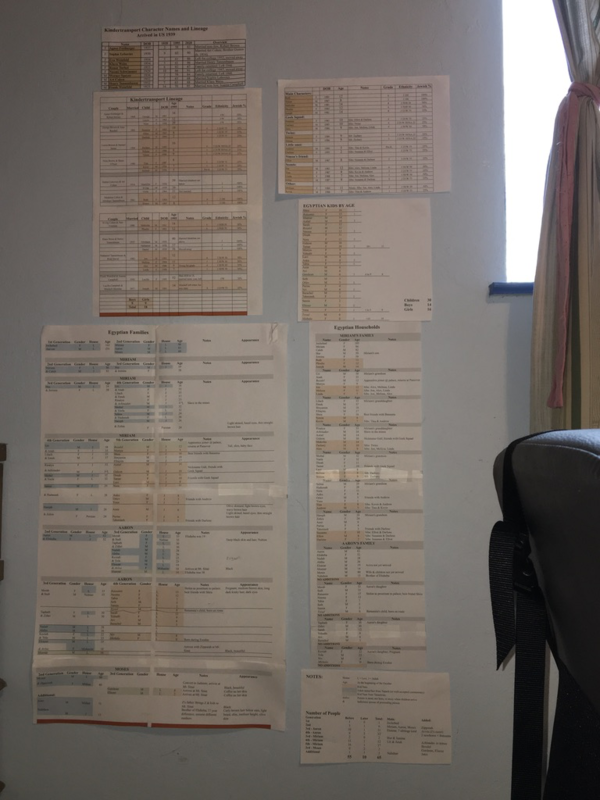 All of my family charts are in Excel and it's still the tool I use for them. But it wasn't helping me move forward with creating my new set of characters and dividing them up into living units. Family Tree Maker: My other hobby is genealogy. One thing I'm especially good at is making family trees (with well-cited sources of course). I figured my best bet was to go through the Torah (starting with Exodus), some other Biblical books, and commentary, and boom, I'd at least have all the named people, then I could add in missing wives and kids. Except...no. It is not straight-forward and there is no existing genealogy that is uncontroversial (don't say Flavius Josephus because he made choices most commentators think are not right). After creating entries (and facts and relationships) for 242 people, I gave up. Index Cards: My husband's a writer who is finally starting to get published. Index cards work for him (complex soap opera comic series) and he pushed me for weeks to give it a try. I tried it. I've now got 2 dozen mostly filled out index cards buried under the clutter of my desk. It would be great for keeping track of individual existing characters who have scenes with various other characters, but did not work at all for me to create characters within large families. Paper: Paper tears. Paper gets lost. Paper becomes kitty beds. But wait, I have a wall. I started off with my modern characters and their lineage (parents, aunts and uncles, and grandparents). Two pages for the genealogy, 1 more page for the grandparents, another page for the grandchildren. Printed. Taped to the wall. I reference this all the time! As in 2-12 times per chapter. Much more helpful than having to open the right Excel file/sheet and find the info. I have 43 modern characters, many of whom you never see or even hear about; they're for my own use. My Egyptian characters were a lot more complex. I've got 65 of them and every single one is present in the story. I won't use most of the names or show most of the people, but I needed to know who they were. This was the part that was like pulling teeth. First getting the known characters, then adding more, with names that worked, with characteristics that worked. But done. Color-coded. Printed. On the wall. 10 pages. After that, diving them up by household (who is in which hut) was pretty easy. As was deciding which of the 18 time-traveling children was staying with them. That last bit went on the wall today. 3 pages. Scotch tape to attach pages to each other when needed. I had originally used scotch tape to attach to the wall, but it was hard to move pages and I was worried about damaging the paint. I used blue painter's tape but hated the look. Now I use the painter's tape rolled up and on the back of the pages. My question is not "what is the best method/tool for creating and tracking characters?" That is a very individual thing. What works well for one person will be awful for another. And what worked for me for this novel may not work for my next one. Besides, it's an opinion-based list, which isn't something we do at Writing.SE. What is the best process for figuring out the methods and tools you need to create characters and keep track of them while you're writing? I'm going to echo @galastel: trial and error. I have a historical fiction novel based on real people and events. I had to compile all the people known to affect the events and then map all their genealogies to identify who was whose cousin in nth degree, who had been raised by whom (so I'd know where they'd have their loyalties), and who had participated in different events while supporting which party. I ended up with hundreds (well past 300) people just to identify kinship bonds, when I was really only going to need about 30 (with different levels of participation in the plot). Nevertheless, since these people could name their ascendents sometimes for over five generations, I had to map it out. I also tried several of the methods you used. To be honest, I was so desperate at one point that I tried out methods even though I knew they wouldn't work. Then I started creating diagrams. Focusing on character A: First, all of his family, showing his blood connection to some of the 30 important characters. Then, all of his friends and enemies (within the important 30). Reapeat the family diagram for those friends and their families and see how the kinship bonds match across families. Createa summary diagram with the most important family connections. I ended up with tons of diagrams. Some of the diagrams were only used to organise my ideas, so I usually keep the 'summary' diagrams handy and, as I need them, I spread them about. I use Yed for the diagrams, by the way. Based on my experience, if one thinks a method isn't going to work (and you have a valid reason for it) it probably isn't the best option to go for it. Unless one's desperate, of course. It's still a waste of time, though. What really needs to be done is understand what are the particular difficulties of the data that needs organising. Talking of a large social network (as groups of characters tend to be), one should first think about what is essential. Is knowing who is whose parent and sibling what matters? Family tree software should work. Is it a matter of knowing who lives where? A map with households and a list of inhabitants per household. Is it both? Then the map could be colour coded for each family. The more information is required, the more complex it becomes. If what one is looking for is a host of human connections (kinship, likes-dislikes, etc), then social networking software would be the thing to go for (I'm currently learning Neo4J for this precise reason). Basically, identify what you need to get out of the information and look at the tools and methods you know of in order to see if they can give you what you need. One may have to combine more than one tool and method, though. Once you decide on one, choose a small simple sample (family relationships between two brothers and their children) and see if it works. If it does, slightly enlarge the sample with complex connections (add frequency and quality of contacts, or perhaps add the circles of acquaintances one of those characters interacts with). See if it works. If it doesn't, see if it's a fundamental fail or if it can be mended by using the tool/method together with another tool/method. If it's a fundamental flaw and there's nothing that can help it work, cross it out and move to the next option. I wouldn’t go blindly into trial and error, not in these days where all the information in the world, almost literally it’s at your fingertips. Instead do a little bit of research, read up on what has worked for other people and pick up the approach you find more appealing or mix a couple that sound like they’ll work for you. Then apply those and test what’s working and what’s not. Identify what is not working and research again for those specifics. See how other people solve those specifics problems and don’t worry about what seems to work. Eventually you’ll arrive at a system that is pretty much tailored to your specifics needs and way of working without too much effort. I'm not trying to pretend to answer your question. I can't hope to say what is best, especially for someone who isn't me. But I will at least attempt to order what I've tried from what seems to have worked the best for me to what has clearly worked the worst. I do feel the need to point out you're working on something more ambitious than anything I've attempted. My history isn't that good; I've never had the guts to try writing something in a defined historical real-world setting. Most of the suggestions I'm going to give at the end of this were things people gave me as advice, and I've found at least some utility of them. Feel free to skip down to the next horizontal break; the stuff between here and there is appendix stuff I just don't want to risk looking like my conclusion. I've set up a wiki on my home computer, localhost only, for several of my stories. Each character gets a page, and each time I write new things about the character, I try to update their wiki page. Their page starts off with what story or stories they're in, because I have accidentally put a character in the wrong story after I started with the wiki concept. But once I got that fixed, it hasn't been too bad. What exactly goes in to each wiki page varies widely by the character, but it at least starts off with how they're associated with the most prominent character not them that they're associated with, and then lists their various relationships and details some notes with them. Characters with quirks tend to get much more written about them than others. If they have an accent, that might include everything they ever say as a reference. I've kept text files with notes about all of the characters, one file per story. The same sort of information goes in there, except it usually doesn't list multiple relationships for characters, and it won't include quotes or as much background, just because of trying to keep all the data roughly proximal. If there are characters with accents, there will be a second file for quotes. I've kept text files, one per character, sort of like a wiki. The best result of this effort was it gave a proper seed for the start of the wiki. The worst bit is navigating through dozens of files without using hyperlinks is rough. The worst part isn't finding which file to open, but rather which window to switch to. Microsoft Word's inability to have more than one file open per file base name could come in handy here. I've used an actual database. If you're going to go down this path, I'd strongly recommend that you use an off-the-shelf solution written specifically for the purpose. Trying to write my own thing is not beyond my computer sophistication. But trying to write my own author details database while also trying to write a story is an excellent way to forget what you were writing about, because the glitches in the software will come out at the worst times. I think maintaining explicit fields for the various sorts of data is probably overkill; if you have a wiki and you have discipline, that works. Re-read the story whenever I'm at a loss for who a character is. This tends to break down around chapter 2. Wait, who the heck is this Mike character? That wasn't who Giselda was talking to! How the heck did I go from her talking to Sfen to Mike? Um, wait, it just literally stops with Sfen in paragraph 12 and starts with Mike in paragraph 13? Oh, crap, Mike was the guy from that other thing. Edit edit edit. This was a really intense dream, I don't need to keep track of my characters, I know all this stuff. In going through all of that, I knew when I needed something better as far as tools when I got to the point where I couldn't keep track of what I was doing. But there always was a time before that I felt uneasy about how I was proceeding. As far as keeping track of characters and how to best figure out the tool, I'd think I've actually had the best luck practicing that with somebody else's work, especially web comics. If I lose track of a web comic's characters, it's no big loss. But I can at least determine whether the mechanism is sufficient for handling a cast of that size. That said, if you have your 107 characters now, I'd strongly suggest at least writing an outline of all of the characters you don't already have at least an outline of before you think about focusing on something else. It's preferable that you jot down as much as you can in that outline, especially bibliography notes. That is unfortunately literally all I wrote down in my character notes for the character I knew second best in one of the stories. I wrote slightly more about her in my dream journal. The problem with intense dream characters is other intense dream characters can shove them aside, and you don't really have any idea when that will happen. I had an intense dream over a decade ago, which I remembered well enough to write about 60k of dream journal entry over the next few days. Expanding on that, I now have over 70,000 words written. That is also a candidate for my least dialog-driven work. It feels like it mostly just needs much better description to make it into something I'd be willing to give to some beta readers. I do have intense dreams fairly regularly, but usually not that intense and rarely so epic. Back in June, I had another dream, which felt about as intense as the one from the last paragraph, but not as epic. It seemed like it could have made a nice short story. I was busy that day, so I only was able to write about 7k of dream journal and 1k of character notes, focusing mostly on the lesser characters because there was no way I'd forget the two main characters. The next night I had an even more intense dream. It was not story material; it was too chaotic and bizarre to make into something I'd be willing to show people, especially since I have a lot of better material. But now all I have of the girl is a description of her and how she becomes a portal. Colonel Mustard is in the Observatory with the Revolver. Adding the who-where-when details to a scene is no different than plotting the current location of a MacGuffin, or pacing the reveal of a plot twist. This information belongs on the main timeline with the other narrative elements and story beats. What hasn't been mentioned is that characters are living and dynamic. They have chemistry between other characters, and have internal motives and sympathies that change due to the events in the story. Each individual has an emotional state that is constantly in flux, and a receptivity to the events and people that are around them. This evolution is their character arc and they must shift from an opening status quo, through an interpersonal conflict with other characters, and finally resolve the conflict by ending on a new version of the status quo. Without this development arc they are not characters just plot devices. Colonel Mustard is frustrated by his wife's irritability, and prefers the quiet company of his loyal horse. This character detail has nothing to do with plot or logistics, but he will be a completely different man when he is around his wife compared to when he is around his horse. In order to show, not tell these facets of his character, he (logistically) needs a scene with his wife and a scene with his horse. Both scenes need to present him with a conflict (however minor) where he reacts differently. This contrast will make him appear to be inconsistent. Is he a simple man with a "frustrating" wife? Or is he an emotionally stunted man who thinks his wife ought to be more like an obedient animal: under his control? Both might be true, but as the reader resolves this apparent dichotomy she fills in the gaps of his personality. It's not really about contrasting a bad wife and a good horse, it's about his temperament and his fundamental viewpoints on the world. The character is presented with 2 contradicting traits – his receptivity changes depending on who is in the room. This type of dynamic detail will probably not be spelled out for the reader, but it profoundly effects him in every scene. He is 1 person filtered by 2 different relationships, both need to feel realistic for this to register as a character flaw or handicap (in writing, a flaw can be "fixed" if the character chooses, a handicap cannot be "fixed" and requires a workaround). There is no inherent conflict to who-where-when, that's just moving chess pieces around the board. But there is inevitable conflict with volatile interpersonal relationships. The "chemical reactions" between characters will drive the motives and personal development arcs even more than the plot. For example: a young man joining the military to defend his country has no internal conflict, he is doing the expected thing for external reasons. But if he joins the military to be more like his older brother and to impress a sweetheart, he has a start-state with internal motives and preconceptions. He is much more interesting because there are so many ways these interpersonal relationships can fail him that will impact his character arc and receptivity. How he reacts is more important than stuff that happens. You need a way to track every interpersonal relationship, the motives and conflicts between all the dynamic characters, over the course of the story. It is less important to plot relationships between non-dynamic characters who don't change, but it's still helpful to sketch in their general impression towards all the other characters even if it is superficial. What do these characters want/need, and how do they require the other characters to get it? For me, this starts with plotting my main character arcs individually, everything they should experience in the logical narrative order to tell their story. Before this process, I typically have a loose plot outline consisting of Mary Sue characters and their flattering "power moments". I also have an idea of the obvious personality clashes (A___ is quick to act, B___ is over-cautious), but this is general and not yet dynamic. I use a pseudo-Snowflake method to define the start and end states of the most important characters, then I fill in with various beats and conflicts needed to define their arcs. It's like Snowflake because it starts with broad generalities, but as I add specific story beats it starts to feel more like a subplot. There will be a call to action, try/fail cycles, a mid-story crisis, and a resolution that isn't really what the character wanted or expected. This is strictly character building, I do it individually for each character, and at this early stage the arcs don't align with my main story plot or each other. The arcs need to be outlined independently for each main character. I'll repeat what I said at the start, each character needs their own arc (beginning, middle, and end) or they are not characters just plot devices or supporting roles. Once I have their character arcs I have a better idea of who each is as an individual. At this point, the Mary Sue moments look out of place so I will rework my main plot outline until the motives and actions make sense. I also have a better idea of the situations I need to support each arc, so secondary characters are emerging and being consolidated, as well as worldbuilding and backstory to frame them. I don't merge the main character arcs, instead I try to cross-pollenate them: a story beat in one triggers a story beat in another. Getting the arcs to influence each other isn't difficult, everyone is effected by the main narrative, meanwhile the interpersonal moments are where characters show individual motivation and arc development. One character's momentary outburst leads to another character's self doubt. Main characters de-rail each other leading to distrust and consequences. Likewise characters make sacrifices or misrepresent themselves creating unsustainable house of cards. The more going on in each character's personal conflicts, the easier it is ripple the effects to the other character arcs and have it all feel organic, not contrived. 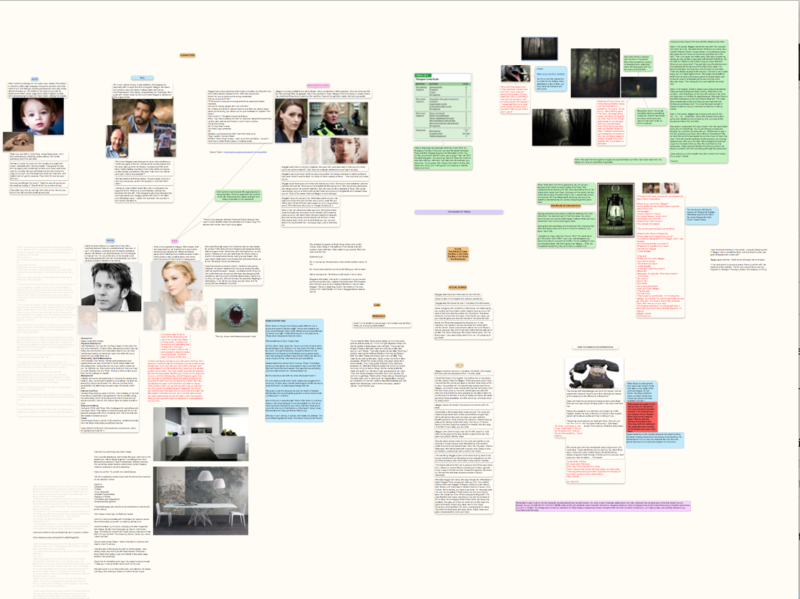 The final phase, which is the actual story-writing, is to approach each scene with a clear idea of where each character is on their arc, and what is currently motivating them. Their dialog and actions will come overwhelmingly from their personal arcs. Even characters who are working together for mutual benefit will not entirely agree. They will have different approaches, and set different objectives. Even in friendly situations they will be advocating and negotiating in support of their own individual goals. In nearly all scenes at least one character is proactively trying to influence the other characters by logic, charisma, dominance, or subterfuge, and this is where the other characters' receptivity comes in. They will agree or resist based on their own receptivity and motives – every scene with character interaction involves this negotiation of goals and personalities. These character differences are like tent poles that lean away from each other to create space between them. Characters never just state an objective fact, everything gets filtered through their subjective realities, everything. When each character is advocating for their own motives, there should never be a situation where the reader is confused about who is speaking. It should be obvious by what they say. The objective "truth" of the story lies somewhere in the space between the characters's differences. For each scene, I refer back to my Snowflake character arcs and make sure each character signals their progress. If the beat signals a lack of progress or stagnation, the arc is still progressing even if the character isn't. Sometimes the point of an interaction is so the arc beat is observed by another character (with or without comment) just so the reader feels the change. In a longer work I'll have a half-dozen main characters with fully developed beat-for-beat arcs, and at least as many supporting characters who have backstory and an evolving arc but don't take up as much space in the actual narrative. They still act according to their own dynamic motives, which must progress in every scene they are in. The lowest tier of characters are essentially plot devices to aid or impede the protagonists, or who act as a Greek chorus to provide context and worldbuilding. They also receive a status quo or starting state, but they don't have much room to evolve. Nevertheless, they will still negotiate for their own goals, but are completely unaware of the plot. Rather than create forgettable throwaways, this frees them to be more selfish, more transparently themselves, because they don't need to negotiate in good faith or compromise with the main characters. They are free to over-react, to insult and provoke, and essentially to lean in opposition to the main character(s) to represent all the things the MCs can't be. They still act as a tent pole to define space between for a larger story. I use Scapple by Literature and Latte, the makers of Scrivener. It's basically a storyboarding tool, much like you have created on your wall, only you can't run out of wall space or damage your walls! Each character gets a place on the board and lines link them to characters they are related to/interact with. For families, each character can have their place in a family tree structure. I add photographs of how I visualise their appearance, and other photographs of people I may be basing their personality on (I often create characters as composites of people I know). I give them a brief description, then a deeper outline of their needs, desires and motivations. As the story comes together, I add portions of dialogue and descriptions and inspirational photographs for scenes and settings (e.g. rooms in their home, things they own, etc.). And if a setting is a crucial part of a story, I give it its own place on the board. I assign colours and styles to different notes for clarity, and that makes it easier to zoom in and out on specific areas of the board. And, when it comes to the actual writing and I use up portions of dialogue or scene descriptions, I colour them pale grey, so they no longer stand out. The great thing about Scapple is that it can just keep growing, moving and changing, without rewriting index cards or reprinting spreadsheets and documents. You can quickly zoom in and out, even when your board is huge. You can pick up all the pieces for one character and move it around on the board, create space for new characters, quickly delete things you no longer want, etc. etc. You can download a free trial from Literature and Latte. I can't imagine starting a novel without it now. A program you could use is Campfire. It's for fantasy authors who need to keep track of their characters/items/lore/plot/etc. I don't use it, however (Not enough money. ), but have heard many good reviews for it. Hope this helps! I know this is a short answer but I've started to organize characters using Charahub. I think your wall-method may even be more advanced than that! Please don't worry about being 100% crazily consistent; I promise that the majority of your genealogy (and its mistakes) will not be a focal point to readers. It's more important to give emotional and psychologically development into the central characters (or families), and then just plunge right into the interwoven plot. Best of luck! Not the answer you're looking for? Browse other questions tagged characters novel software tools organization or ask your own question.